"Look back in anger" is a common theme on Wednesday's front pages as golf chiefs and RHI boiler owners regret their Northern Ireland investments. The boss of British golf tells the Belfast Telegraph he wishes Portrush had not been chosen to host the Open tournament in the same year as Brexit. Martin Slumbers says Brexit uncertainty is causing him logistical nightmares. He explains organisers need to get more than 2,000 shipping containers across the Irish Sea, beginning on 2 April. "The problem is we don't know whether to reschedule to bring all our containers through Dublin, whether to move them through Belfast, whether to ship them out of the UK now," he says. "I'll be quite pleased when it's over," Mr Slumbers admits. 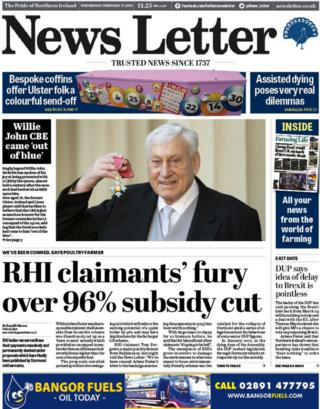 The News Letter leads with the "fury" of RHI boiler owners over proposals to cut their fuel subsidy payments by up to 96%. A Ballymoney poultry farmer who bought 10 biomass boilers, before controversy over the scheme led to the collapse of Stormont, tells the News Letter: "We've been conned". Tom Forgrave has to pay back "huge loans" for the boilers and says that without the subsidies, the situation is "going to be hell" for him and other RHI claimants. Nothing is certain in life except death and taxes, and the steady stream of customers in the funeral business inspired one man to change his career, reports the News Letter. A photo of a pink coffin, decorated with bingo balls, adorns the front page. The colourful casket is the creation of Desy Stevenson, a former bricklayer who now makes bespoke, eco-friendly coffins which feature images with a personal connection to the deceased. He got his bright idea while he was building an extension to a coffin factory during the recession. "I'd never pictured coffins being produced at this rate, it was like a conveyor belt," he tells the paper. The Irish News leads with a report that Prime Minister Theresa May has conceded "for the first time" that Brexit might be delayed. The paper speaks to all the main local political parties, and, while there is reluctant support for a delay from the Ulster Unionist Party, Sinn Féin and the SDLP insist the Irish border backstop must be protected in any circumstance. For a second day, the Daily Mirror's front page focuses on the horrific killings of Clodagh Hawe and her three young sons at the hands of her husband Alan Hawe in 2016. The County Cavan murders were the subject of an RTÉ programme earlier this week, in which Mrs Hawe's mother and sister called for a new public inquiry into the case. Inside, the Mirror and others report a disturbing "near miss" involving a passenger plane and a person using a paramotor at 2,000 ft. The paper says the Flybe flight, which was travelling at 195mph came "within a split second of smashing into the paramotor". The paramotor pilot, who was using a parachute powered by a propeller on a backpack, came within 100ft from the plane before it landed safely at Belfast City Airport last August. The Belfast Telegraph also picks up the story, saying that an accident report blamed the paramotor pilot for "flying into conflict" with the plane carrying 70 passengers. It adds that the paramotor pilot has not been traced, despite "intensive" efforts. Rural parts of Northern Ireland are becoming "ATM-free zones," warns the Mirror, after a series of raids which has seen cash machines ripped out of walls by stolen diggers. It says a delegation from Retail NI met police in Belfast to discuss the problem it is causing for rural customers. The police tell the paper a "dedicated team" is investigating the ATM raids but they also appealed to digger owners to make sure their equipment is locked against theft.